Kirstjen Michele Nielsen popularly known as Kirstjen Nielsen is an American attorney. She served as the sixth United States Secretary of Homeland Security. She was appointed Secretary of Homeland Security in December 2017. She resigned from the Secretary on 7 April 2019. She is a former Principal Deputy White House Chief of Staff to President Donald Trump. She was also the chief of staff to John F. Kelly during his term as Secretary of Homeland Security. What is Kirstjen Nielsen Famous For? She was the United States Secretary of Homeland Security under Trump's administration from December 2017 to April 2019. Where was Kirstjen Nielsen Born? Kirstjen Nielsen was born on 14 May 1972. Her birth name is Kirstjen Michele Nielsen. She was born to a United States Army physicians. Her father is James McHenry Nielsen, and her mother is Phyllis Michele Nielsen. Her birth place is in Colorado Springs, Colorado in the United States. She holds American nationality. Her zodiac sign is Taurus. Her father is of Danish ancestry, whereas her mother is of Italian descent. She has two siblings, a younger sister, Ashley, and a younger brother, Fletcher. The family moved to Colorado Springs to Clearwater, Florida following her birth. She attended the Georgetown School of Foreign Service, where she graduated with a Bachelor of Science degree. She then attended the University of Virginia School of Law, where she received her Juris Doctor in 1999. She also studied Japanese studies at Nanzan University in Nagoya, Japan. She served as Special Assistant to then-president, George W. Bush. She then served as Director for Prevention, Preparedness, and Response (PPR) at the White House Homeland Security Council. She set up and led as Assistant Administrator, the Transportation Security Administration's Office of Legislative Policy and Government affairs. She left the Bush administration in 2008. She then became the founder and President of Sunesis Consulting. The company won a federal contract in September 2013. They won an initial award of about $450,000 to "provide policy and legislation, technical writing, and organizational development" to the Federal Emergency Management Agency. She was a senior member of the Resilience Task Force of the Center for Cyber & Homeland Security Committee at George Washington University. She also served on the Global Risks Report Advisory Board of the World Economic Forum. She served as John F. Kelly's chief of staff at the United States Department of Homeland Security (DHS) after Kelly assumed that position in January 2017. Kelly became White House Chief of Staff in July 2017. Nielsen became the Principal Deputy Chief of Staff under Kelly. President Donald Trump nominated her to be the new United States Secretary of Homeland Security in October 2017. She replaced Acting Secretary Elaine Duke. The Senate confirmed her nomination in December 2017 by a 62-37 vote. She was sworn in as Secretary of Homeland Security on 6 December 2017. She testified before the United States Senate in January 2019 in favor of merit, rather than family, based immigration. It was reported in March 2018 that Nielson agreed with the enactment of the Presidential Memorandum for the Secretary of Defense and the Secretary of Homeland Security Regarding Military Service by Transgender Individuals. She first said that she had not seen the intelligence community briefing that Russia had tried to interfere in the 2016 presidential election. She later said in May 2018 that she agreed with the intelligence community's assessment. Nielson said in October 2018 that China has become a major threat to the US. She also stated that China is trying to influence US elections. Nielsen, an acting Attorney General Matthew Whitaker, Commerce Secretary Wilbur Ross, and FBI Director Christopher Wray announced 23 criminal charges in January 2019 against Chinese tech giant Huawei and its CFO Meng Wanzhou. The charges also include financial fraud, money laundering, conspiracy to defraud the United States, theft of trade secret technology, provided the bonus to workers who stole confidential information from companies around the world, wire fraud, obstruction of justice, and sanctions violations. She testified at a congressional hearing on 15 May 2018 that she would enforce the then-newly enacted Trump administration policy of separating parents and children who crossed over the US-Mexico border, noting that similar separations happened in criminal courts "every day". She stated in June 2018 that the Trump administration did not maintain a policy of separating migrant families at the Southern border. The trump administration had in six weeks separated approximately 2,000 migrant children from their parents at that point. In June 2018, she held a press briefing with White House spokesperson Sarah Huckabee Sanders in June 2018 amid growing public outcry about the family separation policy. She accused the media and member of Congress of mischaracterizing the administration's policy. She dismissed the suggestion that the administration was using family separations as political leverage to force Congress to support Trump's broader immigration agenda or to deter migrants from coming to the United States. She also contradicted comments made earlier by Attorney General Jeff Sessions, Chief of Staff John Kelly and senior adviser Stephen Miller. She was present at Trump's signing of an Executive Order in June 2018 ending his "zero-tolerance" policy of separating children from families. The Intercept reported in September 2018 that she had previously personally authorized the family separation policy after receiving a 23 April 2018 memo by the heads of three federal immigration agencies, US Citizenship and Immigration Services, Customs and Border Protection, and Immigration and Customs Enforcement, recommending the family separation policy for the express purpose of deterring migration. She had avoided attributing deterrence as the purpose of the policy at the time of the report. There was an incident at the San Ysidro border crossing between California and Mexico on 25 November 2018. The groups of Central American migrants tried to forcibly cross the border into the United States. Some of the migrants threw rocks at US Border Patrol agents. The patrol agents fired tear gas into the crowd. There were families with small children in the crowd. A photograph of a woman and two small children being tear gassed went viral. they drove extreme criticism from the public as well as the Foreign Ministry of Mexico protested firing the tear gas and demanded a full investigation. She said in a statement that the caravan had acted violently in the past and they used women and children as "human shields". She also stated that over 600 convicted criminals traveling with the Caravan flow. A 7-year-old girl, Jakelin Caal died in the custody of US Customs and Border Protection (CBP), an agency of the Department of Homeland Security (DHS) on 8 December 2018. Another boy from Guatemala, Felipe Gomez Alonso, 8, died in the custody of CBP on 24 December 2018. Nielsen stated in a statement on 26 December 2018 that the death was "deeply concerning and heartbreaking" and also cited US immigration system failings for a growing border crisis. She also stated that she had ordered her agency to the bolser medical screening of children at the southwest border and had enlisted the medical corps of the United States Coast Guard to provide an assessment of CBP's medical programs. 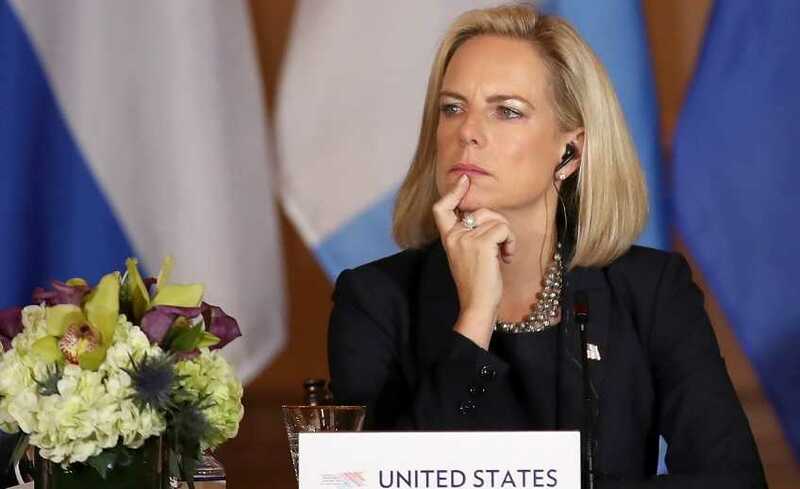 The New York Times reported in May 2018 that Nielsen considered resigning after President Trump berated her during a cabinet meeting for the purported failure to secure US borders. It was reported that the tension between Nielsen and Trump started after she and other DHS officials resited Trump's call to separate undocumented immigrant parents from their children while in custody. She denied that she threatened to resign. 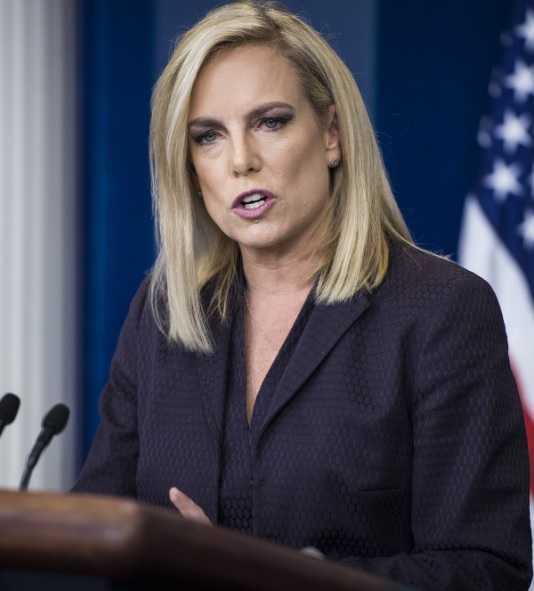 She finally submitted her resignation as Secretary of Homeland Security on 7 April 2019 after a White House meeting with the President. She stated in a tweet that she had agreed to remain in her position until 10 April "to assist with an orderly transition and ensure that key DHS missions are not impacted." Kirstjen Nielsen is unmarried and does not have any children. There are no pieces of information regarding her dating life as well. She might be dating or might not be dating anyone at present. She has maintained a low profile regarding her personal life. She currently lives in Virginia. What are Kirstjen Nielsen's Body Measurements? Kirstjen Nielsen stands at a height of 1.7 m i.e. 5 feet and 5 inches tall. She has a body weight of 120 lbs i.e.54 kg. She has an average body build. Her reported body measurements are 34-28-34 inches. She has brown eyes and black hair. What is Kirstjen Nielsen's Net Worth? Kirstjen Nielsen served the US administration at different positions. Her annual salary is unknown. Thus, her net worth is unavailable at present.